I am very much a bronzer kinda girl. I hardly ever wear blushes, I own a couple that are very nudey/brown toned that I use more or less as bronzer anyway. I dislike 'out there' pinks on my cheeks hence why I have always been on #TeamBronzer. Bronzer is not just to warm up your complexion. It's used to chisel the outer perimetres of the face, force a glowy complexion (bronzers with shimmer) and of course pull the entire look together. 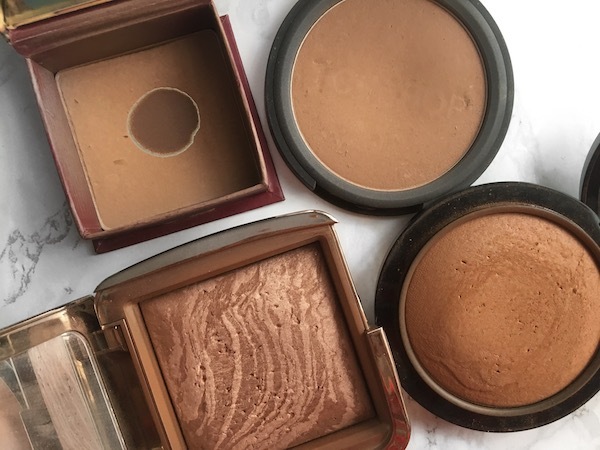 I have a hell of a lot of bronzers that I've accumulated, but here are my 4 most used ones that have been repurchased without fail. Don't forget to let me know what your favourites are in the comments section below! Apologies, I know my swatches are pretty crappy! My arm is extremely fair so the swatches weren't so great. Follow me on Instagram *_skinfacebeauty* to see how these bronzers look on me! I picked this up on a whim a year or so ago when Boots were personalising them for free. 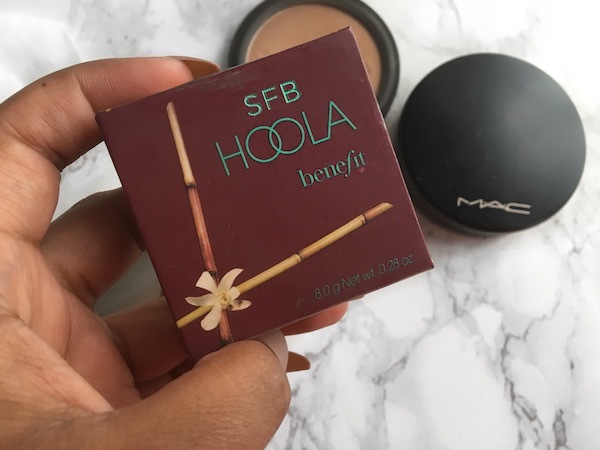 Obviously, the easily influenced girl I am, purchased my very own Hoola and had SFB engraved on it. Soon as I got home, I tried it on and fell. in. love. It's one of those bronzers that looks different against different complexion. I've used this on a few friends who have a darker complexion to me and it looks stunning on them. 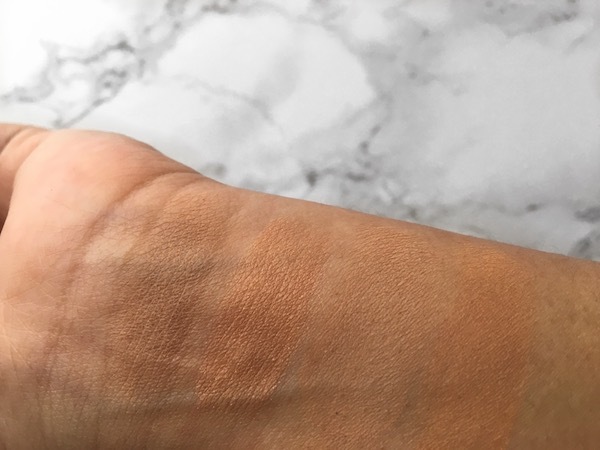 It's not patchy, it blends out really well and it's the perfect shade to contour with. 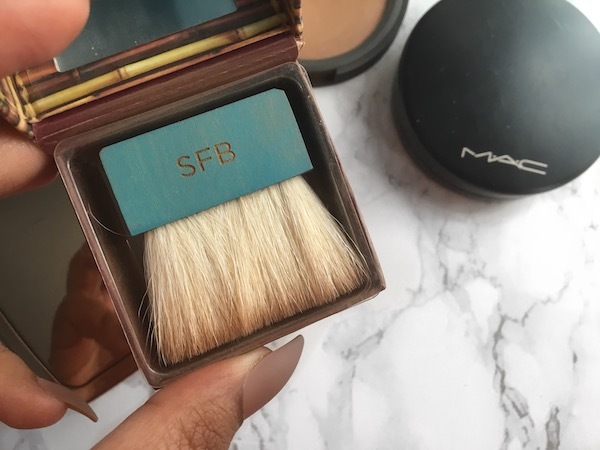 It comes with a mini contour brush which I don't really reach for, but it's useful for on the go top-ups if you're ever switching up your makeup from a day to night look. It also doubled up as an eyeshadow shade too! The purchase of this bronzer was a result of me walking into a SpaceNK store, excited to purchase a Hourglass foundation but was disappointed because of the lack of shades at the time. The makeup enthusiast I am, I didn't want to leave empty handed so the lovely assistant recommended this bronzer. Again, I was impressed! Surprisingly, I don't really hear many people talk about this, it's so underrated. It has slight shimmer to it so when it is applied on the cheeks, the glow is unreal, it's one of Hourglass's iconic 'lit from within' product yet very natural looking, although, it can be built up if needed. There is a hell of a lot of product in the gorgeous, mirrored compact so you definitely get your moneys worth. I purchased this agesss ago, when Topshop makeup was still fairly new. As soon as I purchased Benefit's Hoola, I compared the two and they are both extremely similar. Benefit does have a tad bit more pigment but for the price, Mohawk is definitely the perfect cheaper alternative. It's a gorgeous shade to bronze with as well as contour as it's quite cool toned. It's smooth in texture so it blends seamlessly too. A Desi Perkin's made me buy it item. I love love love all her tutorials, and she used to always opt for this bronzer (which looked amazing on her btw). It's a gorgeous browny bronzer with a slight peachy/tan undertone and it looks sooooo good against my medium-tan complexion. Again, it has a lot of product in the compact so you get your money's worth. I love wearing this during the summer, it's one of those bronzing shades that will bring together every type of makeup look!